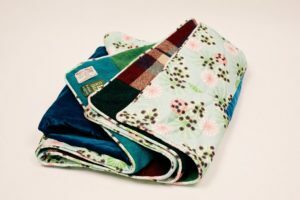 Home Page | Brights Velvet and Harris Tweed Patchwork Double Quilted Throw 100% British Made. | Hemlock printed fabric by Annabel Perrin on the reverse of Brights Harris Tweed patchwork quilt. Hemlock printed fabric by Annabel Perrin on the reverse of Brights Harris Tweed patchwork quilt.